Ah, the hoverboard. The most elusive of coveted future technologies. We've seen a number of products claiming to do the job, but so far none have come through. The Hendo Hoverboard, however, might just be the first. Launched on Kickstarter, this so far looks like the real deal. The board uses electromagnetic technology to gracefully glide about an inch above the ground, though it can only work over conductive materials and runs for just seven minutes. But limitations aside, it's still a working hoverboard, and its creators are hoping to turn it into something you'll actually be able to buy. All they need is $250,000 to make it happen, and if you actually want a hoverboard to call your own, you'll need to put up a cool $10,000. 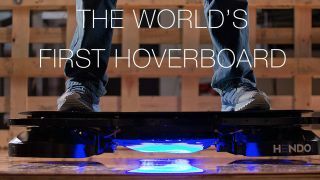 But let us repeat: it's a working hoverboard.